A classic pineapple upside down cake is made with rings of canned pineapple and has maraschino cherries placed into the center of each ring. I typically leave out the cherries – unless cherries are an integral part of the cake flavor I’m making – and replace them with more pineapple (or something really crazy, like spam). Canned pineapple is great because, not only is it tasty, but it has a long shelf life that enables you to make pineapple upside down cakes at a moment’s notice. But upside down cake recipes rely so much on canned pineapple that you might find yourself at a bit of a loss if you actually have a fresh pineapple available. And if you’re a pineapple fan like I am, you may have wondered if you can make pineapple upside down cake using fresh pineapple. Fortunately, the answer is yes you can make pineapple upside down cake using fresh pineapple. 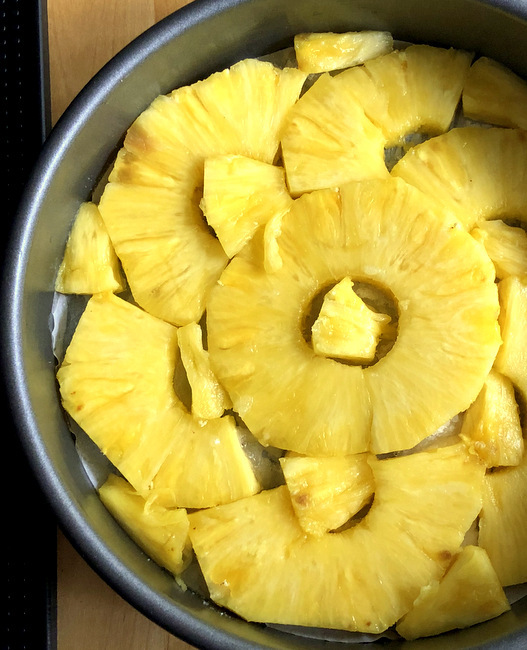 To use fresh pineapple, you’re going to need to create your own rings. You can do this by trimming away the exterior of your pineapple, cutting it into 1/4-inch thick slices (or slightly thicker) and using an apple corer or similar tool to remove the pineapple’s core from each slice. Alternatively, you can use a pineapple corer to more quickly shape rings, though you’ll lose a bit of pineapple compared to the hand-cut method. Once you have your pineapple rings, you’ll notice that they are probably larger than the rings of canned pineapple. You will need to be creative when putting them into your baking pan. Start with the center ring, then use large pieces (half rings) to fill in as much space as you can. When most of the bottom of the pan is covered in pineapple, you can add in some cherries (if you’re a traditionalist) or small pineapple chunks (if you just want as much pineapple as possible) to fill in the gaps. From there, you can proceed with your recipe as written. The finished cake may have a slightly different look to it, but it will be at least as delicious and a lot more satisfying to eat. The post How to Use Fresh Pineapple in an Upside Down Cake appeared first on Baking Bites.